Here the Lord is teaching us that there are two ways and two destinations. One is heaven and the other is hell. Elijah, told the people on Mount Carmel: “How long will you halt between two opinions? If the Lord be God, follow Him. If Baal, then follow him,” (1 Kings 18:21). As we see, the most important spiritual decision that anyone will ever make in life, is the decision regarding their eternal destiny, which far outweigh the trivial ones that most people focus on a day to day basis. As the word of God tells us, we will live forever and we have two options, hell and eternal punishment, or heaven and eternal joy. Jesus is teaching us that there is a very serious choice that we need to make, a choice that renders an eternal finality. As we read our Creator’s words and teaching we still have a chance, but one day it will be too late; therefore His sermon leads to a choice that we need to make while there is still time. There’s only one possibility for your destiny and there are only two choices, not many, just two. 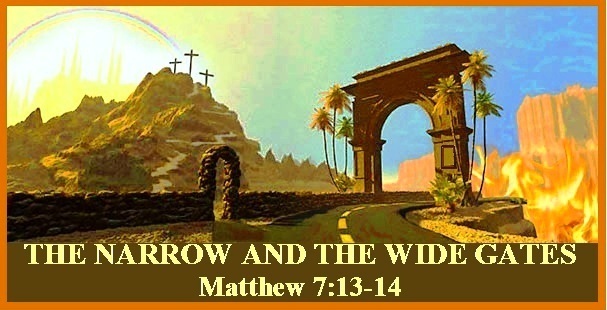 There is a narrow way with a narrow gate. And there is a broad way with a broad gate. Jesus is talking about two destinations – life and destruction; and two groups of people, the many and the few. Verse 13 begins with a command, “Enter by the narrow gate.” The gospels itself is a command, repent and believe in the Lord Jesus Christ. The gospel always comes as a command to obey. It is not enough to study about the narrow gate, to admire what Jesus said, because hell is going to be literally filled with people who admired Jesus and His teaching but did not follow it. You must go beyond being fascinated with the work of Jesus Christ and admiring Him, you must enter the narrow gate of salvation through faith in Him. In Acts 4:12 we read, “There is no salvation in any other name, for there’s no other name under heaven given among men whereby we must be saved.”There’s only one way to be saved, there’s only one Person who is the Savior, therefore, faith in Him and obedience is required for salvation. Christ and Christ alone is the gate. Without Him there is no salvation and no heaven. 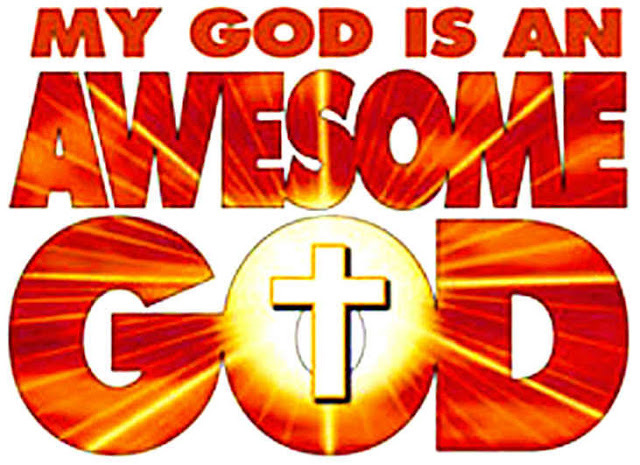 There is no other way in; all other ways, although promoted by false teachers as heaven end up in hell. Any deviation from the person of Jesus Christ, the work of Jesus Christ, or the gospel of Jesus Christ by faith and grace alone will lead you to hell. You must make a commitment to come to Christ because He is the only way. When we continue reading Matthew chapter 7 we see Jesus making the comparison of the true and false disciples. The false ones are the ones who are on the broad way, and who have been lead astray by false prophets, doctrines and beliefs. They will tell Jesus one day: “Lord, Lord, did we not prophesy in Your name and in Your name cast out demons and in Your name perform many miracles?” Then He will declare to them, I never knew you, depart from Me, you that practice lawlessness” (vs. 22-23). Remember: “It is a dreadful thing to fall into the hands of the living God”(Hebrews 10:31); unless you have decided to spend eternity in hell and apart from Him. "Produce your cause, saith the LORD; bring forth your strong reasons, saith the King of Jacob. . . Shew the things that are to come hereafter, that we may know that ye are gods: yea, do good, or do evil, that we may be dismayed, and behold it together." There is so much going on in the world related to Bible prophecy that it is sometimes helpful to take a step back and contemplate a bit on the Big Picture. It is easy to get so caught up in the details that one misses the awesome power of the Big Picture itself; the embodiment of the old saying about being unable to 'see the forest for the trees'. Bible prophecy is more than a prediction about the future. It is a promise about the future. God doesn't just list events out of context, the events emerge later out of the promises He makes. God promised the restoration of Israel in the last days as a benchmark against which to measure other end-time's promises. To bring about the restoration, God promised that the Jews would be forced out of Israel, scattered worldwide, persecuted worldwide, and that they would then return to Israel. All of these promises were fulfilled in the context of the greater Promises of the Big Picture; the return of Christ for His Church and the national redemption of the Jews. The Bible contains hundreds of prophecies. Some were fulfilled more than 3000 years ago. Others have been fulfilled since then. The most astonishingly unlikely prophecy of Scripture was fulfilled on May 14, 1948, when Israel resumed its seat at the table of nations after a 2700 year absence, as prophesied by Daniel, Ezekiel, Hosea, Isaiah and Jesus. Israel was established as a nation some 3400 years ago. The Jews lost sovereignty about 2700 years ago. Israel existed under a succession of conquerors until AD 70 when the Jews were banished from the Holy Land by the Romans. These early immigrants from the East later gathered together with the survivors of Hitler's Holocaust in Western Europe, and, under the slogan, "Never again" declared the rebirth of the sovereign state of Israel. The Soviets soon clamped down on Jewish emigration, and Jewish 'refuseniks' languished in Soviet labor camps until the USSR collapsed and 'gave up' her Jews -- from the north. In 1991, during a 36-hour covert operation, Israel airlifted 14,325 Ethiopian Jews to Israel in defiance of the Mengistu regime then in power who was 'holding back' the Ethiopian Jewish community from emigrating to Israel. Since then, dozens of other rescue operations have been mounted for isolated Jewish communities world-wide. God's promise was fulfilled exactly as it was given, in order and to the last detail. Allow yourself a second to contemplate that verse and what it reveals. God's 'signature' is to start at the end with a Promise, then outline in advance how He will keep it. God not only promised Israel's restoration, but in so doing, foretold, in detail, the events that would make restoration necessary -- and the order in which He would accomplish it. Down to details like the subtle difference between 'gathering' from the West and commanding the South to 'hold not back'. Awesome. NONE of this was even possible to be fulfilled only a generation ago. Today, it is so much a part of the daily newscasts that it loses its impact. Step back from it for a minute and see it for what it actually is. The scenario playing out before our eyes conforms exactly with God's promises regarding Israel in the last days. That is just part of the Big Picture. It's awesome. All the rest of the details are, in and of themselves, just as awesome. But when you step back and see how each detail is so interdependent on so many other details, 'awesome' isn't quite adequate to describe it. The attention to detail confirms for us that no matter how chaotic and out of control world events seem to be, everything is going according to Divine Plan. God remains in control of events and He told us how it all turns out in the end. And since He hasn't been wrong yet, we can trust Him on it.